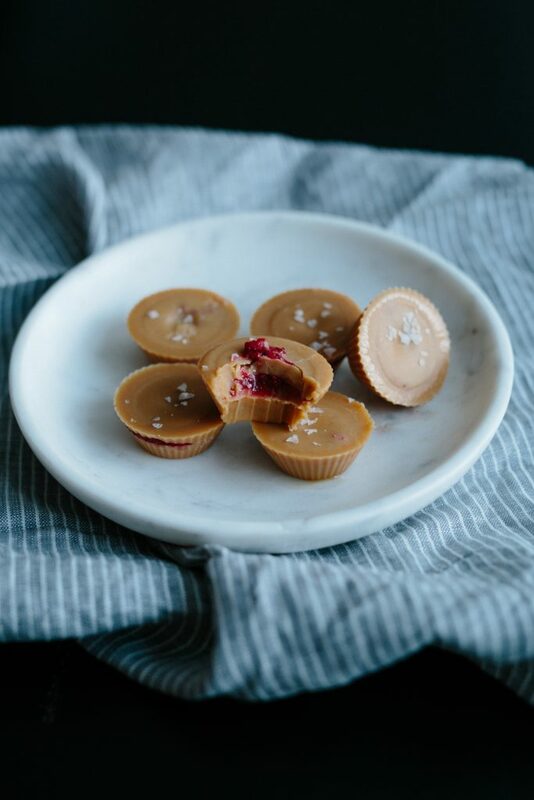 I’m a sucker for peanut butter and jam. I just love peanut butter in general and it seems I have passed that onto my son and daughter. One of my favourite snacks is banana and peanut butter and even better on sourdough with a drizzle of honey and Maldon sea salt. The kind of stuff we grew up on except with white bread as the addition. Ava decided she would make these as her after school snack being that they are easy to make, require no baking, but refrigeration and it was a cold day so we placed them outside to chill. 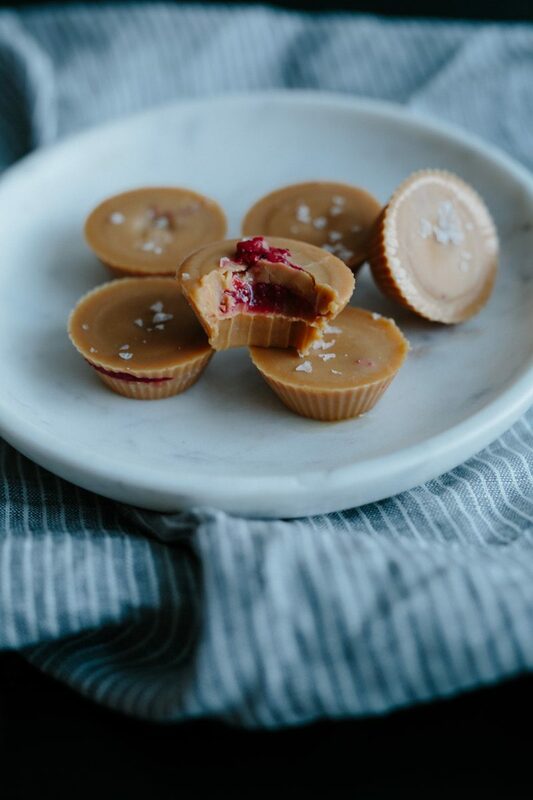 I found a really good, organic, unsalted peanut butter at Our Daily Brett so that became the base of these delicious treats. We used maple syrup but honey would work as well. We also made extra chia jam for use later on. Drizzle with melted dark chocolate for extra deliciousness. Combine the peanut butter, coconut oil and maple syrup in a small saucepan and warm until melted and smooth. Stir in the vanilla. Set aside. In another small saucepan, combine the raspberries, honey or maple syrup and water. Bring to a boil and allow to simmer until the berries are broken down. Stir in the chia seeds and allow to sit for a few minutes, stir again and place in the fridge to chill. The jam should be thick – add more chia seeds if it’s too runny. Line a mini muffin pan with mini liners or silicon liners. Spoon the peanut butter mixture into the liners until half full. Chill until set. Remove from the fridge and place a small dollop of jam on top. Smooth out as best you can. Top with more peanut butter mixture until the jam is covered. Place in the fridge to chill until almost set. Remove and sprinkle with a little sea salt then back in the fridge to chill completely. Store in the fridge – because of the high fat content (good fats), they will melt.